Cauliflower pizza is a healthy, convenient and low-carb dinner. Sharing a recipe that’s a hit in our family and quite easy to put together. 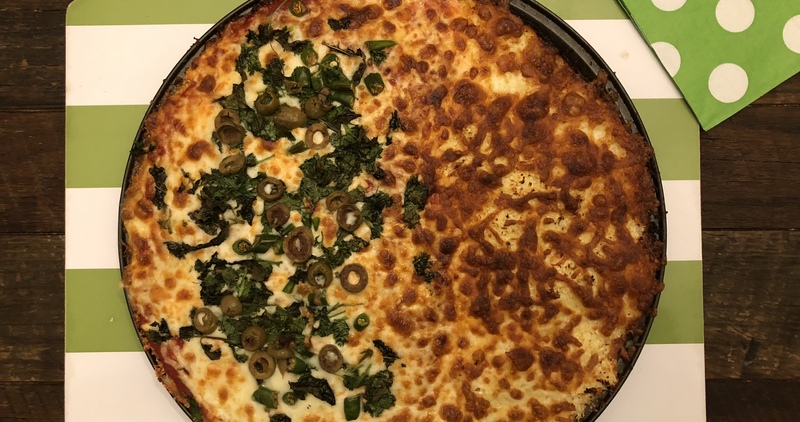 I make the pizza half-and-half, since my kids like a plain cheese pizza. I add different toppings for my husband and I on the other half. For the other half, you can add toppings you like such as: cooked leftover meat/chicken, olives, basil/mint/cilantro. Get creative! You can leave the pizza vegetarian also. Place inside the oven for another 5 minutes for the cheese to melt. You can also switch on the broiler for the last one minute. And that’s it! The super healthy pizza is ready! It will be a little crumbly but the health benefits out-weight the less-than-perfect texture. The best part about this pizza? I don’t fall in a food coma like I do after having a regular pizza. You might worry that cauliflower will make you gassy? The ginger and garlic paste takes care of that. You can add a little apple cider vinegar in the crust also if you’re still concerned. I do not use chicken mince for cooking purposes and instead i grind chicken cubes which i wonder sometimes can be used as pizza crust. Have you tried using ground chicken as pizza crust? the only thing i worry is that it needs a very little time for cooking and using it in pizza might make the crust hard as my family need over cooked cheese.